This year in Vienna,Workday held its annual European conference and its first in the DACH region. It was the largest yet and demonstrates the penetration that Workday has across Europe already,just from the different languages heard at the conference. Enterprise Times sat down with Chano Fernandez, Co-President Workday and spoke about the company’s progress and growth. With its results imminent,no financial details were shared but he described it as “an exciting year”. This year saw the acquisition of Adaptive Insights and several key announcements at the convention. 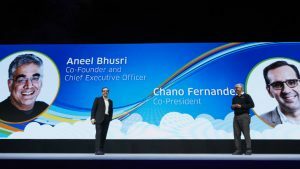 We asked Chano Fernandez what the implications were for Workday Planning now that Adaptive Insights has been on board a few weeks. He also spoke about how Adaptive will continue to service those clients not using Workday. He also talks honestly about the Workday platform, where it is now and how quickly it will become a reality. Fernandez covers the Workday approach to verticals and responds to a question of how SAP are attacking the PSA market with S/4HANA and SuccessFactors. Fernandez also talks about the expansion plans for Workday in the near future. He commented: “We are looking to growth in the US but more internationally”. He talked about Asia and South America. How will Workday measure success? The company has an intense focus on customer satisfaction and employee satisfaction. While revenue growth is important, it is these two metrics that Workday wants to focus on to improve the latter.